Rob: What is your preferred load for that gun? I’d like to see some hard data but legend surrounding the CZ 75 (and 85?) suggest that the slide being built within the frame gives better accuracy due to design. Factory issue the slide is very stiff to rack. After installing the Pro Kit with reduced spring tensions slide operation improved tremendously. I have yet to measure single and double action pull weight. I should put that on my short list for the spring. pistols you have to admit that. do what LC did to his. Not bad for a former commie, and once Nazi country. But they did make guns for both of them. rifle than the AK47, it was accurate. I shot CMP with DD/Master types who've been shooting longer than I've been alive, and they noted that the CZz don't get sloppy over time due to slide/frame fit like other designs will. Until CMP changed the rules, it was only 1911 and Berettas, and if a unit was competing, more often than not they'd bring stuff from the armory that you could manually wobble the slide to frame. We also measured the bore axis of the CZ compared to a Les Baer, and it was a good bit lower, with a nice high grip and solid beavertail and good grip angle - which all adds to the consistency of better accuracy. The other nice thing is CZ leaves the slide/rails contact rough for a singular wear in. They smooth up nice the way old school machining used to anticipate - they wind up married (wear fitting) to each other uniquely. Other designs pride themselves on universal fit - take a slide of x and put it on frame y and it will still work. Work, yes, but accurate? No. I've heard more than once from a new CZ owner, the inside is rough, not like my Brand-X. To which I say, clean, lube appropriately, and shoot a few 100. I shot a few hundred NATO loads in the 75BD before I put the Def Carry kit on it - it was a nice solid pull on the slide after that, not rough or overly heavy. Just right. Pete, I was shooting S&B NATO in it mostly. It's built for NATO; typical Luger isn't as hot. If I get to shoot IPSC/IDPA like I'm hoping to, I'll go down to Berry 124 HP/RN over a softer charge. 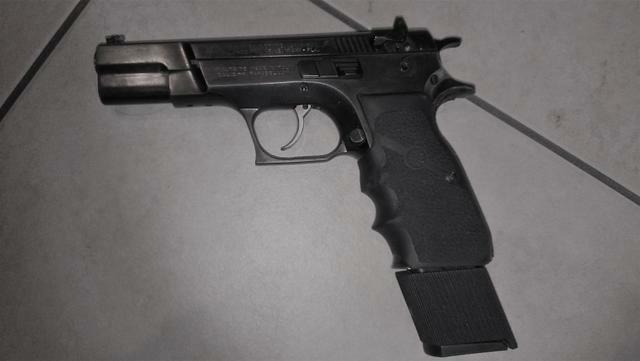 The P-01 was designed for NATO as well, and with the full dust cover riding the recoil wasn't difficult. But I'm thinking that's going to become the Mrs. house-gun with a light/laser, and a milder diet.